Mrs. Brown hired two of Long Beach's finest tradesmen to build Brown's Court Apartments; Architect Joseph Halstead Roberts and Contractor Raymond P. Mussetter. To complement their work, Mrs. Brown chose the latest features for her bungalow apartments. Each was a cozy one-bedroom, with an efficient floor plan and lots of windows to capture the ocean breezes and sunshine. Hardwood floors, coved ceilings and crown moldings adorned each one. In the living room, built-in bookcases with desks and china cabinets were selected. Picture moldings and wide baseboards were used. A large closet with built-in drawers and a windows for ventilation was included. The glass front doors were typical for the period and added additional light. Scones and windows flanked the mock fireplaces, which were influenced by Batchelder tile to finish the look. The kitchens were big enough to add a table and built-in ironing boards. Each kitchen had a back door that led to a small porch. Even the back doors were charming with drop windows, adding more light and ventilation. The original cabinets featured the latest hardware with an assortment of butterfly hinges, cupboard latches, glass knobs and bin pulls. 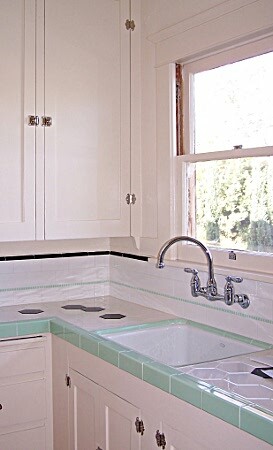 Although the original tile is gone, it included a simple design with color accents as show in the photo. See more photos of the kitchens here.